What is Mopar® Vehicle Protection? If you need auto service at a price that won’t break the bank, take advantage of the Chrysler, Dodge, Jeep, Ram oil change coupons and auto repair coupons at Midway Chrysler Dodge Jeep Ram! At our Chrysler, Jeep, Ram, and Dodge dealership, oil change coupons and other service specials are available so Grand Island drivers can have the opportunity to save because we believe that vital maintenance and repairs shouldn’t cost an arm and a leg. We routinely rotate our service specials so that you can make use of everything from brake service coupons to great prices on tire services. Before you schedule your next service appointment in Kearney, do yourself a favor and peruse our current auto service coupons. Whether you’re on the hunt for oil change specials, serpentine belt replacement services, or our general service coupons, our attentive and highly-trained service department will accommodate you and whatever Chrysler, Dodge, Jeep, Ram you drive. Contact us to take advantage of our service specials! Looking to restore your vehicle to its original luster? Then take advantage of our Auto Spa for car detailing! Balancing tires, tax and more than 5 quarts of oil, extra. Most V6 engines and other select vehicles require more than 5 quarts of oil. See dealer for eligible vehicles and details. Diesels and synthetic/synthetic blend oil may be higher. Taxes not included. Present offer at time of service. Regular Wheel Alignment Service: $129.99. Proper wheel alignments allow for safer driving. Wheel alignment will also extend the life of your tires. Incorrectly aligned wheels is a main cause for uneven wear on a tire. 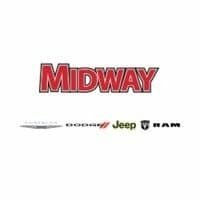 Midway Chrysler Dodge Jeep Ram	40.6749668, -99.0838379.